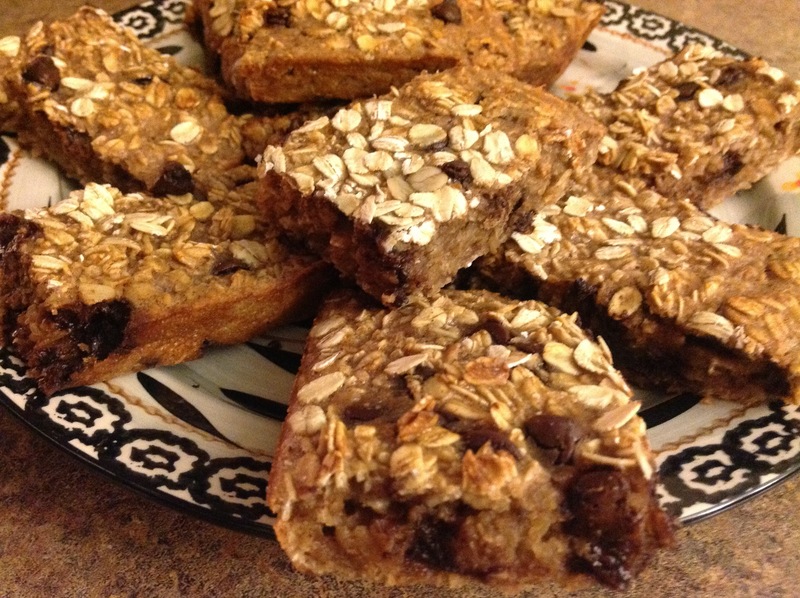 Yesterday, while searching through the WordPress blogs, a recipe for healthy snack bars caught my eye. Late last night, after tidying up the kitchen, I couldn’t go to sleep without pulling out my stash of healthy ingredients to make these moist and flavorful treats. When my children woke (at the unearthly hour of 5am) to head out the door for swim practice, I had a few of these packaged and waiting for them. I used an 11×7 baking pan for this recipe and they really couldn’t be any easier to make. Thanks, Anne, for a great recipe! In a medium bowl, mix dry ingredients. in a separate bowl, mix wet ingredients. Pour wet into dry, mixing until combined. Pour batter into a 11×7″cooking-sprayed baking dish. Sprinkle a few raw oats on top. Bake 30 minutes. Cool completely before cutting into bars. You won’t be disappointed… Thanks for stopping by, Sandrina! Anne has so many great recipes! Hope you stop by and visit here site. We love these bars! My daughter always requests dark chocolate granola bars… this recipe is going in my to-do list. Are granola bars freezable? Yes, they are freezable, Shanna. I wrap them individually with plastic wrap and then stack them in a freezer safe Ziplock bag. Take them out one or two at a time and thaw them on the counter. Dark chocolate sounds perfect! Linda, A double batch is in the oven now in a parchment-lined 9×13-inch pan! 🙂 Your idea to freeze individually-wrapped bars is wonderful! 🙂 We followed the recipe to a T, with the exception of adding some of the suggested dried fruit (cranberries), substituting almond milk for dairy milk, and using white whole wheat flour. I will upload a photo to your FB page. 🙂 Thanks for the great recipe! The smells of vanilla and cinnamon are heavenly. Linda – We are all busy, no never worry about responding, etc. I am hope you are well and the transfer is a good thing for you both personally and professionally. I uploaded some of the photos of your recipes (that we made) to your FB page for SMKAC. 🙂 Enjoy your weekend!